Oh, he is such a special dog. Full of energy to play, full of patience for brush his hair. Enjoying long walk, love to be dirty...and so on. Comments for My special "TRINI"
No, we live in eurpe, country is coled Slovenia. We live in capital city coled Ljubljana. City of lights is coled Paris in France. Well Happy Birthday to Trini. Wow with the snow it must be beautiful. Isn't where you live called the city of lights? May his Birthday be filled w/fun & treets. 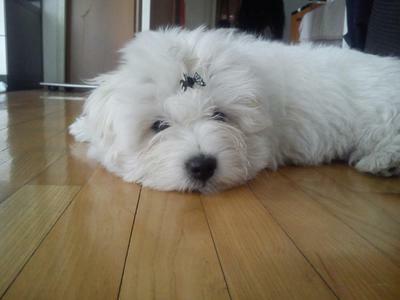 Have a wonderful time spending the day together w/your handsome Coton. Thanks for nice words. Trini is realy nice dog. He Will be one year old in 10 days. This photo was taken 6 months ago. Today was snowing all night so we have been for first time out on the snow. He just loved it. Trini is special. Just gorgeous. Reminds me of our Molly. They are wonderful companions. Speak human and just want to be with you no matter what your mood.